One Of Everything Bag, originally uploaded by indiaeden. I haven't sewn anything in a while,things are still pretty crazy around here,not much energy for crafts I'm afraid..or much else to be honest! This is something to cross off my list of sewing projects for January. I was very restrained,and only put three things on my list,only two more to go. 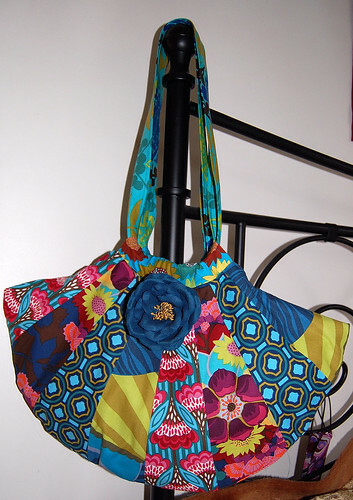 This bag is made using the "One Of Everything" bag pattern in Anna Maria Horners book, "Seams To Me", and using Anna's gorgeous Garden Party fabrics. I didn't follow the pattern exactly,I changed the handles,and added interior pockets,plus some ric rac on the interior for fun (and to hide a row of stitching I didn't like!). I also added the fabric flower brooch for fun. my machines are untouched - am craving to sew but have no time at all... have an essay due this week, and more backing up on that! maybe I'll carve out an hour - I need to make something gorgeous!! Lovely work ! I like that bag and the flower very much ! Beautiful bag! I love the colours! Back to work after the Xmas break.